I love cooking. I really enjoy coming up with delicious ideas and creating them in the kitchen. It's something that I've grown to really enjoy and want to share with people. Not too long ago, though, I was terrible at it. I could make popcorn and cereal (because I don't put milk in cereal) and guacamole, and I was good at anything that came out of a box. So when Pete would tell people his favorite thing I cook is popcorn, I would laugh. We should have had a DIY Wedding Popcorn Bar because he loves it so much, but we didn't. Even though I can actually cook now (and cook well, thank goodness), Pete will still tell you that my popcorn is the best. In fact, he invited my parents over for movie night recently and said "And Lisa is making her world's famous popcorn." I make it in the pressure cooker, on the stove, with some salt and butter. Sometimes I turn it into bacon caramel popcorn (for blog posts only). If the latter appeals to you more, you'll love the idea of a Wedding Popcorn Bar at your wedding. We put together this post with the help of Gifts.com (they provided us the photos, popcorn recipes, and inspiration). You won't need too many popcorn bar supplies for this. Your venue may actually have a bunch of things that you can borrow for it. That's always my suggestion. See what you can use that your venue already has, then purchase the rest. Make the popcorn. You'll want to pop it fresh (because that's so much better than microwaveable popcorn or purchasing bulk popcorn, and makes it world's famous if your significant other really loves you). Then, turn that popcorn into something special with a variety of popcorn flavors. For every recipe, we suggest popping one cup of popcorn kernels in two tablespoons of oil to make 20 cups. Coat with four tablespoons of melted butter and two pinches of salt. Then, toss with the recipes below. Rosemary & Parmesan Popcorn Recipe: 1 teaspoon chopped rosemary, 1 to 2 tablespoons grated parmesan, and a pinch of garlic powder. White Chocolate & Sprinkles Popcorn Recipe: 1/2 cup white chocolate chips melted with 1/2 teaspoon of shortening and 2 tablespoons sprinkles. Cinnamon & Sugar Popcorn Recipe: 1/2 cup white sugar, 2 teaspoons ground cinnamon, and 1/2 teaspoon vanilla extract. Coconut & Curry Popcorn Recipe: 1/2 teaspoon coconut oil, 1 tablespoon toasted coconut flakes, and 1/2 teaspoon curry powder. Wasabi & Cayenne Pepper Popcorn Recipe: 1 teaspoon brown sugar, 1 teaspoon wasabi powder, and 1/4 teaspoon cayenne pepper. Matcha & Chocolate Popcorn Recipe: 1 melted chocolate bar, 2 tablespoons matcha powder, and 1 tablespoon coconut oil. Bacon & Caramel Popcorn Recipe: Get the full recipe here. Figure out where in the venue this will fit. We had a lounge area across from our ballroom and that's where we had our candy bar set up. When you figure out where you are setting up, start with a long table. 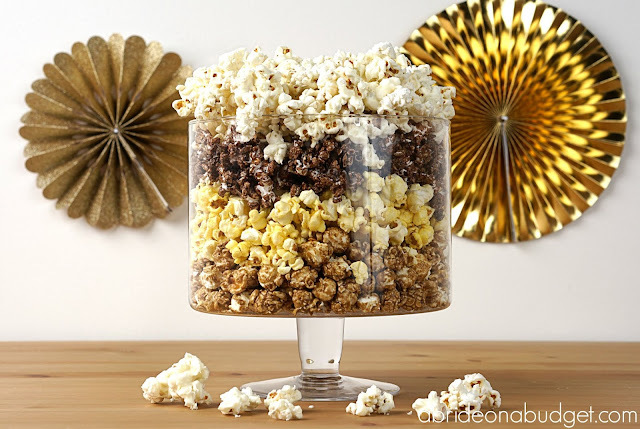 Put each of your different popcorn combinations in a huge glass bowl. Stick with glass because they are food safe. 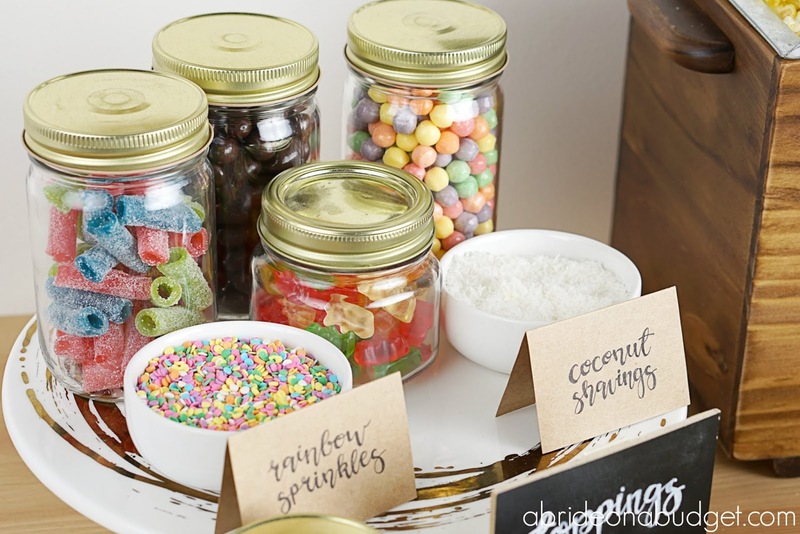 I love the look of galvanized buckets (we used them for our wedding candy buffet), but you can only put wrapped food in those. Create labels to mark each of the different combinations. 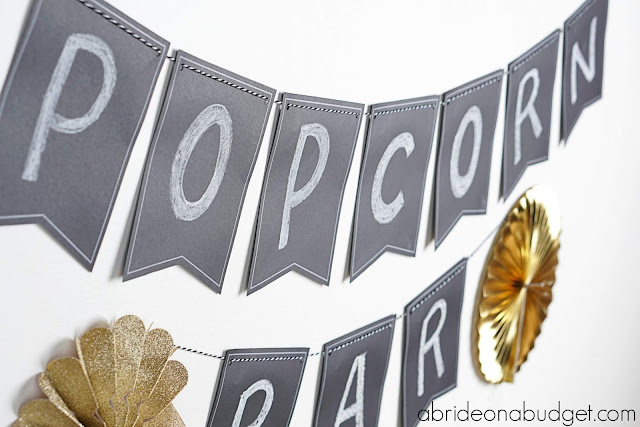 Chalkboard labels with clothespins are perfect for this. You'll also want to pick up glass salt shaker bottles and label them with your popcorn bar seasonings: chocolate powder, salt, sprinkles, cinnamon, etc. Then, at the start of your table, set up your popcorn bar containers. 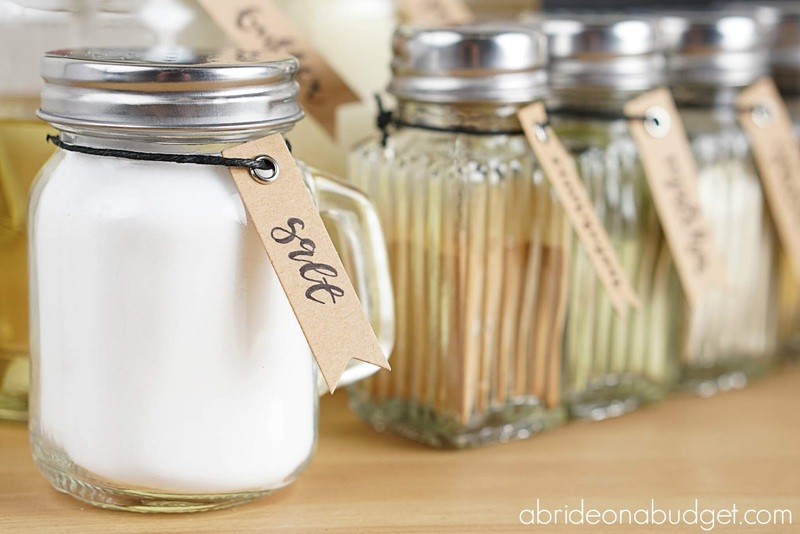 You can even leave a permanent ink market at the start of the table in case your guests want to write their name or decorate their containers. Finally, put your popcorn bar banner behind the set up. 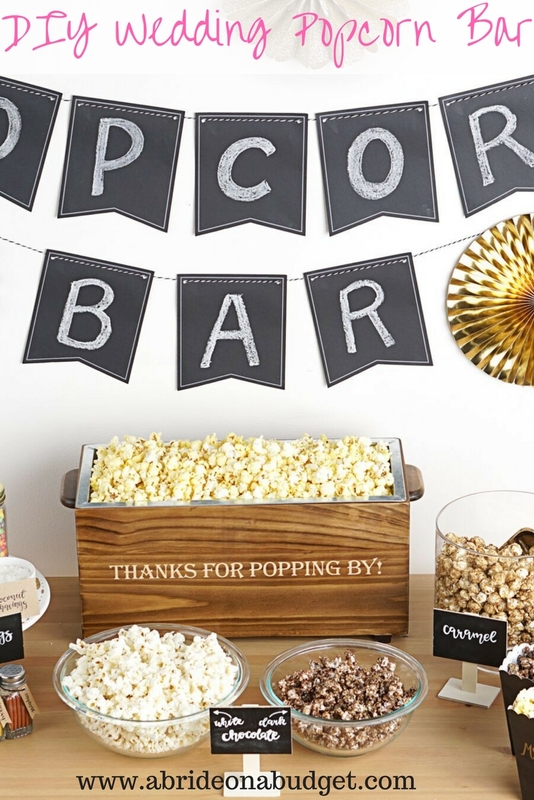 Set this up at the end of the night so that your guests can grab a container of popcorn on the way out of your wedding. Everyone loves a late night snack. It's just a lot of fun. And who isn't hungry after dancing all night long? 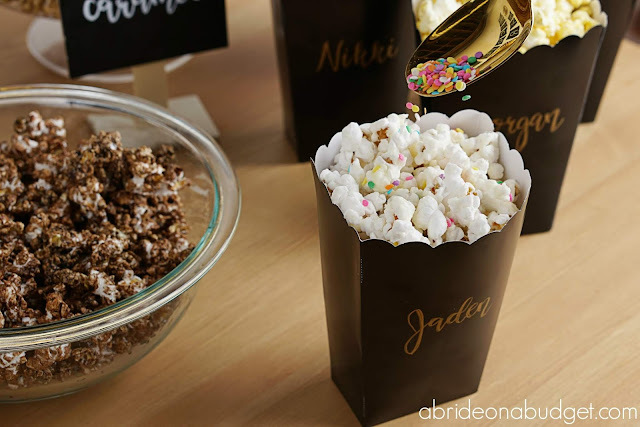 BRIDAL BABBLE: Would you put together this DIY wedding popcorn bar for your guests? This sounds like so much fun and I love popcorn! Thanks for sharing on To Grandma's House We Go! These are flavor combos that I wouldn't have thought of. Thank you for sharing with us this week at Celebrate Your Story, have a great week holiday. Great snack idea for a budget wedding! Thank you for sharing on Merry Monday! Hope to see ya next week! What a wonderful party idea! Thanks for sharing with Party in Your PJs!